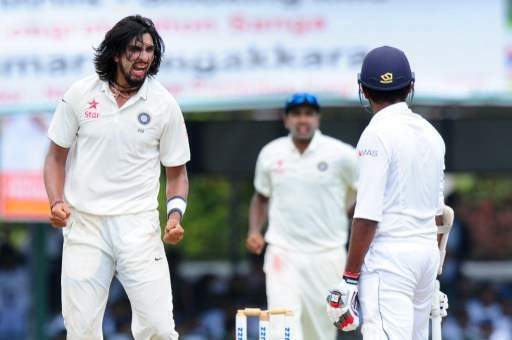 India fast bowler Ishant Sharma was fined 65 percent of his match fee on Sunday for twice breaching the Conduct of Conduct on Saturday during the third day's play in the second cricket Test against Sri Lanka at the P. Sara Oval here. The tall, lanky pacer was charged with breaching Level 1 Article 2.1.7 of the International Cricket Council (ICC) Code of Conduct which relates to "using language, actions or gestures which disparage or which could provoke an aggressive reaction from a batsman upon his/her dismissal during an international match", on both the occasions. "Sharma was fined 15 percent of his match fee when he first provoked Lahiru Thirimanne following his dismissal. He was then fined a further 50 percent of his match fee for also provoking for Dinesh Chandimal following his dismissal three overs later," an ICC statement said. "While sanctioning Sharma for the second of the two offences, match referee Andy Pycroft noted that the circumstances surrounding the second incident, including the more aggressive nature of the conduct, warranted a higher sanction than the first of the two offences." Following the close of play on Sunday, Ishant admitted the offences and accepted the proposed sanctions. If he commits a further breach within 12 months, it will amount to his third offence and he will face a sanction of between two and eight suspension points. The charges were laid by on-field umpires Bruce Oxenford and Rod Tucker, and third umpire Ruchira Palliyaguruge.